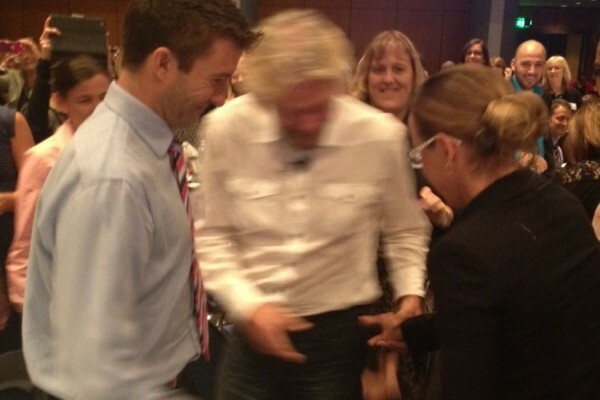 The Day I Got Into Sir Richard Branson’s Pants! I’m no groupie, but I must admit that I was fantasising a little about how I might get myself an opportunity to meet Sir Richard Branson, so when I missed out on tickets to the #BusinessChicks breakfast, I figured it just wasn’t meant to be. A few days after missing out, a fellow BusinessChicks member was looking to sell 2 tickets at her table and a few messages later, we’d confirmed the purchase and I was locked in to attend. Was I Excited? Absolutely! Branson, a self confessed non-tertiary qualified entrepreneur, comes across just like you and me. I loved his unassuming nature, the way he fumbled through some of his answers when questioned on stage, his casual, yet professional attire and the way he cruised into the room packed with over 1300 women. He spoke passionately about workplace flexibility and in particular, work from home (telework) options for women. I knew he was a supporter of this concept after reading some of his responses to Marissa Mayer’s backflip to cease all teleworking privileges to the Yahoo staff worldwide, but I felt like Branson was speaking to me directly, as if there was no-one else in the room and that we were meeting over lunch and talking about the benefits of flexibility for both the business and the team. I can’t vouch for Sir Richard, but to me we were connected. When he finished speaking, to my surprise, instead of heading out a side door or using a jetpack or something like that in a display of Branson showmanship, he jumped off the stage and started down the middle of the room. If he kept his current course, he was on a collision course with yours truly. My heart was beating, butterflies were fluttering, but the opportunity I hoped to have was becoming a reality. OMGoodness!! As he approached, all I thought about were Branson’s two messages that stood out for me on the day: “Screw it, let’s do it” and to take risks. Branson spoke about marketing, the fact that it’s expensive and encouraged small businesses to get their brand out into the market in unique ways. What’s more unique than slipping a business card in the pocket of one of the most inspiring entrepreneurs in the world? As he approached, I noticed his shirt pockets had buttons (darn), they weren’t in any way available for me to do a quick slip of the hand, so I eyed his pants off, purely for business purposes you understand, and noticed that the front pockets were my only target. While I dearly wanted to shake his hand and this may be the only opportunity I ever get, I went with plan A and went for the pants. As you can see from the image above he was a little shocked as my hand fumbled around near his nether-regions whilst trying to get the card deep enough in his pocket to avoid it falling out. Thankfully he realised what this strange groping groupie was really doing and obligingly let me slip the card safely into his pocket. I couldn’t believe I succeeded! I still can’t. 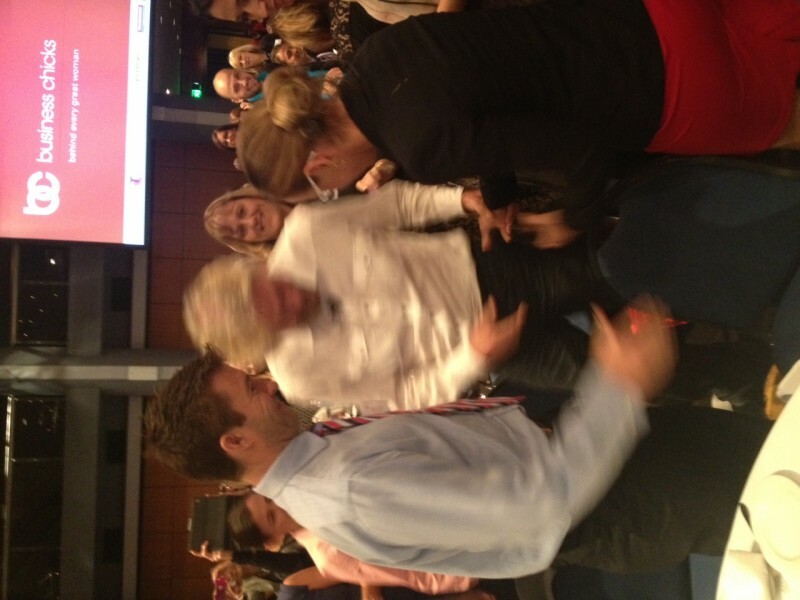 I had just gotten into Sir Richard Branson’s pants! The rest of the day was spent wondering whether the next phone call would be Branson. Of course he’s going to call me to talk ‘School Hours’ and ‘Family Friendly Employment’. Of course he wants Virgin as a key partner for ‘School Hours’ and want to be an ambassador for our brand. Did I get a call? Not yet, so for now, I’ll wait eagerly. I’d love to one day to tell him personally how his influence on this day gave me the confidence to think ‘Screw it, let’s do it’ and that I did it. Until then, I’ve got this blurry photo and an amazing memory. Do have a ‘brush with fame’ story to share? Yasmin is an owner and co-founder of School Hours Pty Ltd.Yasmin's passion for helping others coupled with her desire to achieve a balance between raising children and earning a living, lead her to create School Hours Pty Ltd with her husband Leigh.School Hours will be the place to go for Australian parents wanting to connect with progressive thinking, family friendly employers. Yasmin is an owner and co-founder of School Hours Pty Ltd. Yasmin's passion for helping others coupled with her desire to achieve a balance between raising children and earning a living, lead her to create School Hours Pty Ltd with her husband Leigh. School Hours will be the place to go for Australian parents wanting to connect with progressive thinking, family friendly employers. I soon as I saw the heading I just had to read the article. I can just see you doing exactly that Yasmin. Never miss an opportunity. I’m sure he’ll call soon! Thanks Adrian, it was certainly a ‘once in a lifetime’ opportunity that I just had to take.